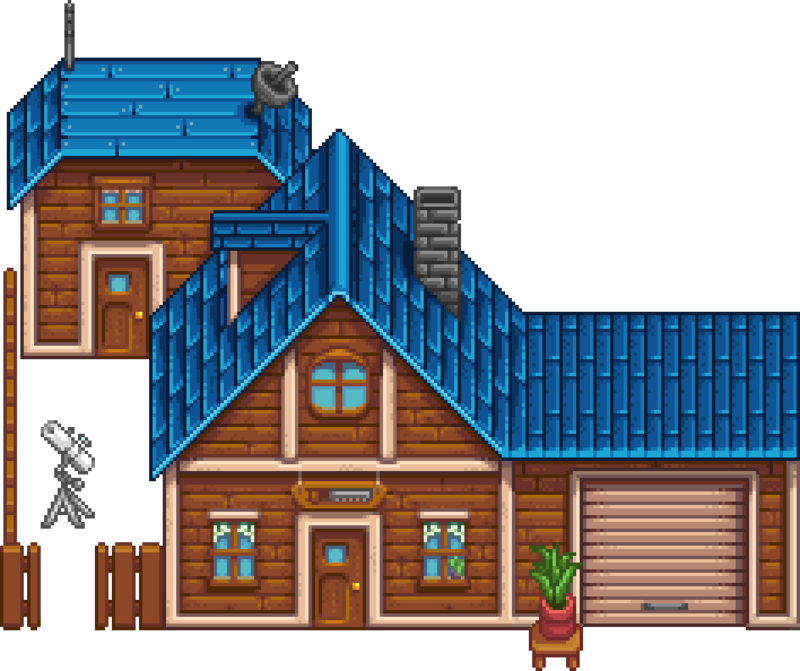 Robin sells furniture, and she can upgrade the Farmhouse and construct new farm buildings. She also buys and sells wood and stone (and buys clay). She will begin construction the day after buildings are purchased, but she does not work on festival days. Most construction projects are finished in 2 days (by the start of the second day after you place an order). The house is accessible from 9:00am to 8:00pm every day, even when the shop is closed. The shop is closed on Tuesdays (except when it rains), as Robin goes to Pierre's General Store to exercise with Caroline, Jodi, Emily, and Marnie. However, she walks past the shopping station at 9:40am on her way. If you enter before then and use the station just as she passes, you can still shop at that time. Similarly, Robin returns home at 8:50pm, and you can also use the station as she enters her home and passes the station. The shop closes at 4:00pm on Fridays, when Robin and Demetrius go to The Stardrop Saloon. If you enter the house before 4:00pm but miss her during open hours, you can still shop if you catch her as she passes the shopping station on the way out, just as on Tuesday mornings. The shop is always closed on Thursday, Summer 18, when Robin goes to Harvey's Clinic. It is also closed on all festival days. If she was still working on a job for you on the day before, then these closures will delay the job completion by one day. However, Robin does work on regular Tuesdays when she already has a job lined up, so there is no delay in that case. The shop is closed all day any day that she is working on a job at your farm. In addition to Permanent Stock, which Robin has for sale every day, she has a rotating stock of Furniture that changes daily. Note that the prices of wood and stone increase in game year 2. The player will receive a letter in the mail on Spring 1 of year 2 saying "The price of raw materials at Robin's shop and Clint's shop has increased". The gold obtained by selling wood or stone to Robin or through the Shipping Bin remains unchanged in year 2+. Plasma TV Can be placed inside your house. Furniture Catalogue Provides unlimited access to almost every furniture item... from the convenience of your home! Below is an expandable table of all items that may randomly rotate into Robin's daily stock. Farm buildings have a variety of uses. Some are required to house Animals. Both Coops and Barns can be upgraded to house more/different animals. 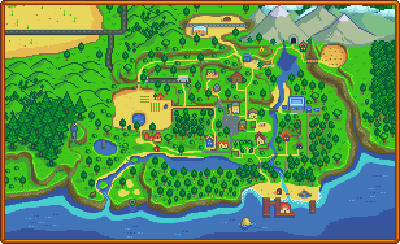 The player may build as many farm buildings as space allows, including multiple buildings of the same type. Cabins and Shipping Bins are built instantly, and Coops or Barns take 3 days to complete; other buildings need 2 days. Existing farm buildings can also be moved at the Carpenter's Shop. This action applies instantly and is free, requiring no construction time, gold, or resources other than your travel time to the Carpenter's Shop. The building's contents move along with the building, all as a unit. Unlike Chests, a building need not be empty in order to be moved. Tip: Building a Silo before building a Coop or Barn will allow Hay to be stockpiled before it's required to feed animals. When upgrading the Farmhouse, the footprint of the building does not change, so no adjacent tiles are impacted. House upgrades add space inside the house as well as accessibility to the kitchen for cooking. Farmhouse upgrades require three days to complete. House Upgrade 3 Adds a cellar under the house, allowing access via the kitchen. The cellar allows the player to craft and house Casks which can age specific products (i.e., Cheese, Goat Cheese, Beer, Mead, Pale Ale, and Wine) to increase their quality and value. After fully upgrading the Farmhouse and completing the Community Center (or purchasing a JojaMart membership), players are able to purchase a "Community Upgrade" at the Carpenter's Shop for 500,000g and 950 Wood. Robin will then build a new house for Pam (and Penny, if the player is not married to Penny). Note that only the host player in a multiplayer game is able to purchase this upgrade. While Robin is in the process of building a Barn, she stands inside the new building in such a way that she cannot be reached or contacted at any time of day. It is impossible then to give her a gift. This can be especially inconvenient if it is her birthday (21 Fall). 1.1: Added Mill, Shed and Farmhouse upgrade 3 for purchase. Added ability for Robin to move placed buildings through the construction menu. Introduced a number of new furniture objects to rotating stock. 1.3: Added Shipping Bin, Cabins, and "Community Upgrade" to construction menu. Added price increase for wood and stone in year 2. Added Basic Log, Log Section, Brick Fireplace, Stone Fireplace, and Stove Fireplace to permanent stock. This page was last modified on 23 April 2019, at 19:40.